Hericium or lion's mane mushroom is a special fungus that resembles a lion's mane and has relatively diverse effects. In practice, I use it in about four situations. First of all, Hericium is very good for various digestive problems, especially when accompanied by heat. Chinese medicine describes these conditions as heat in the stomach. Hericium has the ability to harmonize the stomach and digestion as well as protect and soothe the mucous membranes, therefore used for digestive tract problems such as gastritis, stomach ulcers, heartburn, reflux and improvement of digestion. It is able to soothe the mucous membranes of the digestive tract. If we want to use Hericium to harmonize the digestive tract, it is better to use it in the form of powder (not an extract). You will find one mixture, which contains Hericium in the form of powder, in the offer of MycoMedica. The second area in which I use Hericium is a variety of neurological problems, such as dementia, Alzheimer's disease, Parkinson's disease, multiple sclerosis, neuropathy and neurasthenia. At present, Hericium is the subject of many studies, which examine its ability to stimulate the production of NGF (nerve growth factor). NGF is a protein, which stimulates nerve cell growth and both protects nerves and repairs them, if they are damaged. NGF support, according to recent research, also improves the survival of people after a heart attack. It reduces the risk of heart failure. The ancient Chinese knew about these possibilities and used it to support mental functions and memory, concentration. My patients also include students who take Hericium during their exam periods. It is advisable to use it if we are in stress, especially if the stress is manifested on our body (somatization of stress). These conditions are manifested in various ways, such as pressures around the stomach or chest, frog in the throat, a feeling of internal twitching, tension, inner expansion, premenstrual syndrome, irritability, depression, irregular cycle, etc. The described symptoms are caused by the stagnation of the liver and are usually aggravated by emotions. In such cases Hericium should be complemented with Chinese herbs, which can release the stagnant liver. For example, in one mixture for the relaxation of the liver, which can also be found in the Mushroom Collection. Well, and like other mushrooms, Hericium has significant immunomodulatory and anticancer effects. It is used for tumours of the upper and middle part of the digestive tract and the liver. It is often used for the regulation of Helicobacter pylori. To conclude, I must emphasize that Hericium is very tasty, if you treat it as a foodstuff. Hericium acquired its Czech and English name according to the shape of the sporocarp. It resembles a sea coral or a lion’s mane. The sporocarps have a size of about 7-15 cm, but they can be much larger, up to 40 cm. The sporocarps are cumulous and they are "frayed" on the underside with overhangs, which are similar to spines. Hericium grows on the trunks of wounded deciduous trees and on stumps, especially in areas in the northern hemisphere. Thus we can find them in Europe, Asia and North America. Hericium is an edible mushroom, and a very tasty one. It has its place in the gastronomy of Asian nations. It is both a food and a medicine, used mainly in traditional medicines in Asia, including China. Nevertheless, it was also known to North American Natives, with evidence that they continuously carried powder from the mushroom and used its healing powers to treat open wounds, especially the disinfection and stanching of bleeding. Scientific documentation of the mushroom occurred only in the 18th century thanks to two mycologists: the first one was Francis J. B. F. Bulliard, who named the mushroom Hydnum erinaceus, and then C.H. Persoon in 1797, who gave it the current name Hericium. Knowledge of the healing effects of the mushroom has expanded rapidly and scientific research of the mushroom has begun. 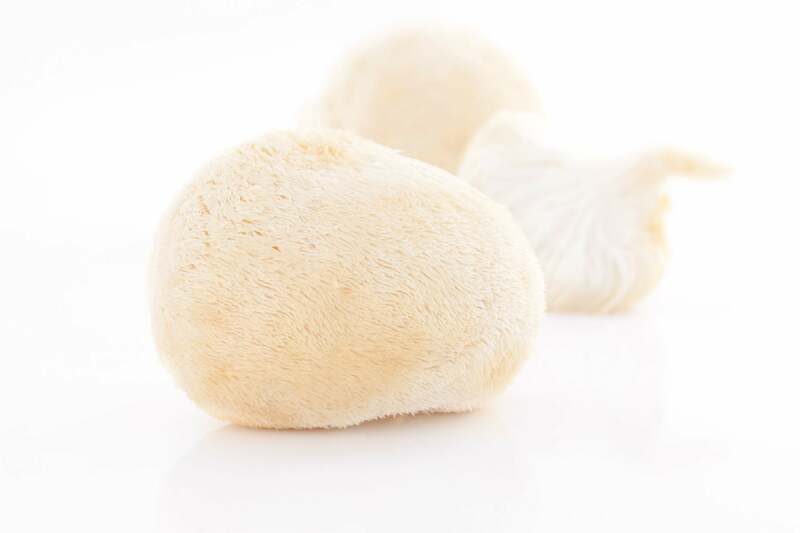 There are many studies and experiments, which confirm the effectiveness of Hericium. As a result, demand for it has grown, now also cultivated commercially. Hericium is a very special mushroom, both in its shape and effects. It is necessary to mainly emphasize its influence on the peripheral and central nervous system, which is quite specific and unique.